Amaranthus Paper & Flora is a unique floral shop that is owned by mother, Cherie Eastburn of Atlanta and her daughter, Meredith Eastburn of Lexington. Each stem is handcrafted using crepe paper as the pair seamlessly combine their talents of floral arranging, art and design. As if you're not already sold on the concept, one big reason to love this business is Cherie and Meredith's decision to create a Giving Initiative. 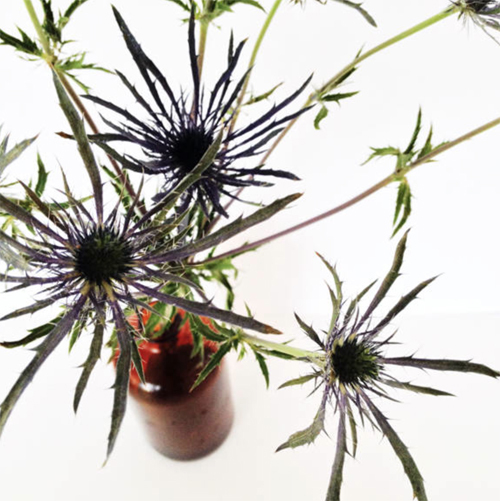 For each bouquet of three stems or more that they sell, they will donate one bouquet to an individual who is fighting a serious health battle- with a focus on immunosuppressed patients who cannot receive flowers or plants because of an infection risk. Lastly, Geoffrey twisted the tops off a few white spray roses and laid them around the table at random. Geoffrey shares that although your goal is to make a pretty table, it's also important to make the table unique to your mom. What's her favorite flower? Her favorite color? Do you have heirloom dishes or something from your childhood that you can add? A thoughtful act goes a long way and never has to cost a thing. I personally love how he brought over tulips- it made me smile as they're actually my mom's favorite flower. To spruce things up a bit, Geoffrey chose the color pink as his second themed table. He left the white tablecloth and incorporated various shades of the color pink in the flowers, plates and glasses. 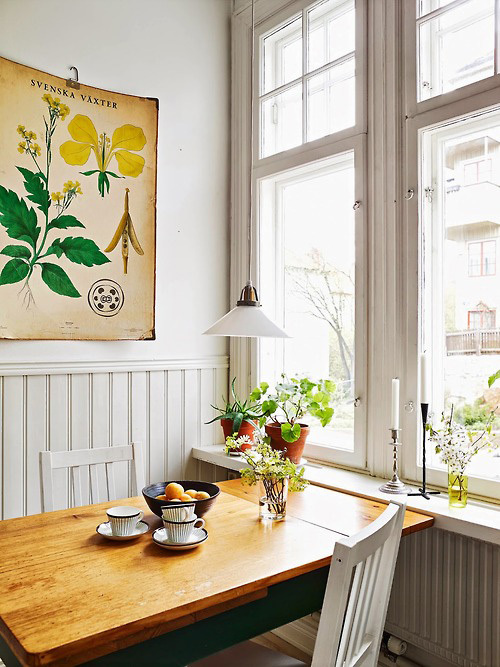 These slight variations in color add personality, cohesiveness and depth. I continue my avid love affair with Atlanta based artist, Ashley Woodson Bailey. I aspire to have one of her beautiful large size floral prints hung over my bed someday...it will happen. I believe it be. In her last series, I was attached to her Magnolia print. In Ashley's most recent work, I am privvy to Michelle- a photograph of a white garden rose that Ashley dedicated to her late friend, Michelle Carey Charba. I am still awestruck that all of her work is captured and edited with her iPhone. She amazes and inspires me...Keep up with Ashley's ever expanding floral portfolio, here. As Ashley's own story is varied, rich and complex, so too are her images. Ashley, "Every image has a meaning behind it. Every stem has a story. Just like all of us." Ashley prints each image on a high quality cotton rag paper called Hahnemuhle. This paper has a fine and smooth matte surface and as Ashley shared, "I chose this paper because of the depth it creates with each image- they come alive." What I love too is although these images are taken on an iPhone they work stylistically in large format. Images begin at 11 x 14" and go up to 40 x 60". I have featured images from her Dark series, but Ashley has a Light series as well that is equally as fetching. I think I'm attracted to the darker images for what they represent- finding beauty through life's trials and tribulations. It's a reminder that our struggles can lead us down new, unexpected paths. Imperfections, pain, fear...If you're open to weathering the storms, that's the good stuff. These felted flower bouquets are about as sweet and original as they come. Kayla Stagnaro is the creative brain behind the scenes and she works tirelessly to craft an array of flower choices and color palettes for her customers. Kayla sells individual stems but has a strong passion for creating beautiful bouquets for weddings and various events. Brides can pick out individual flowers to go with their theme- which would be amazing for the gal who loves to craft herself or is one to celebrate the arts. Plus, I'm now loving the idea of sending a small bouquet wrapped in her brown paper to friends and family. It's a gift to last and is just this great bundle of joy and creativity. As Kayla shared, "I love working with my hands and creating something I know will last in people's homes. I like to think that these felt flowers serve more than a purpose of beauty- they also serve as a symbol of memories, friendship or love when given as a gift." If you're in and around Atlanta this weekend, you can find Kayla selling her flowers at Serenbe's May Day celebration or both Crafted Westside and Young Blood carry her work. Plus, find lots of bouquet options in her Etsy shop. And Happy Mother's Day shopping...may it be fun, inspiring and if you're lucky, original. Lulie Wallace has a pretty name and an even prettier artistic style. Based in Charleston, South Carolina, she creates one of a kind, acrylic-on-birch paintings with truly stunning color combinations. Lulie was born and raised in Columbus, Georgia and in Charleston, she's found her new home and supportive network. She currently paints at a non profit community art center called Redux, with over two dozen other artists. Lulie is passionate about color and is always thinking up the next palette of complementary hues. Lulie, "I am constantly looking around at successful color combos in my everyday life, whether that be in a spectacular blouse or an amazing Charleston sunset. But, I currently have two favorite colors: one is a mint green and the other is like a magenta mixed with white." I particularly like her backdrops which look like wallpaper that I'd love in my own home. 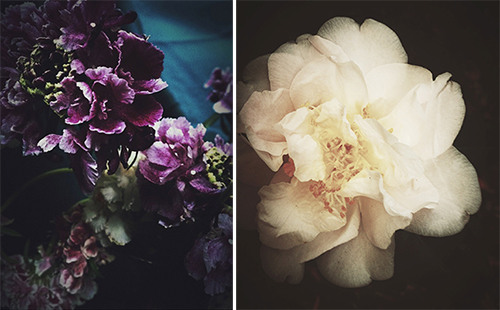 Lulie is drawn to flowers and landscapes that showcase the beauty of mother nature. Yet, like many great artists, she knows it's the imperfections in life that are the good stuff. Lulie, "The less perfect the subject, the more beautiful the finished product." I'm a bit passionate about succulents. As I tend to travel a bit, I like their ease of care plus their various shapes and textures that look so pretty in pots or planted amongst pebbles or gravel. Which is why when deciding on a bouquet or flower arrangement, succulents are a stellar choice. To incorporate succulents into a bouquet, here's a great how-to I found on Poppytalk from one of my favorite florists, Flora Grubb. 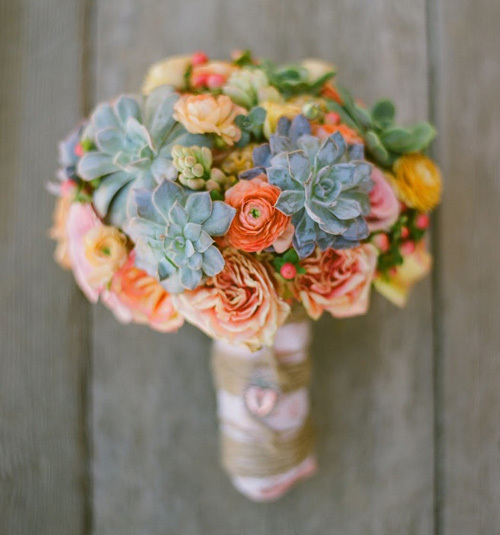 Succulents add a modern touch to a bouquet. Many have dramatic silhouettes and range in color from the lightest green to the deepest purple. But don't be afraid to be daring with your flower choices. Because of their versatility, succulents pair just as easily with the softer flowers as they do with the bright, eye popping ones. Experiment and play, see what works. Good southern flowers and pods to incorporate into your bouquet can include cotton, fiddlehead ferns, pitcher plants, magnolias, gardenias, bluebonnets, calla lilies... the list goes on.